Marinara is one versatile sauce and a popular base to a lot of Italian dishes. Made from tomato, garlic, onions and herbs it can be used with any meats or vegetables you want to toss on it. Though you see the name mostly on Pasta it is not exclusive for it as it can also be used in stews, pizza and dips. Marinara may sound like something associated with seafood because it sounds like “marine”, well that’s quite true but not in a seafood way rather it is more related to seafarers where this sauce originated. Derived from the word “Marinaro”, it was created by sailors in Naples during the 16th century right after the Spaniards introduced tomatoes to the Italians. It was said that this was widely used during that time because it can be stored for longer periods without refrigeration, thanks to the high acid content of tomatoes spoilage was never and issue. Also during those days the sauce does not contain any protein like meats and seafood otherwise it would easily become rotten. Like I said earlier you can use this sauce with any meats and today we will be using it with pasta in combination with squid. A very easy recipe that you can prepare in less than 30 minutes. In a large pan heat olive oil then sauté garlic and onions, once onions are soft and translucent add capsicum and cook for 3 minutes. Add the chopped tomatoes, clam stock, tomato paste, dried oregano, dried basil, bay leaves and cayenne bring to a boil then simmer for 20 minutes in medium heat. Cook spaghetti according to packet instructions, drain then set aside. Season with salt and freshly ground black pepper then add the squid, cook for 3-5 minutes or until squid is just cooked. Turn heat off. Place cooked spaghetti on a large plate then top it with the sauce, garnish with chopped parsley then serve. he he… next meal ito. Wow. 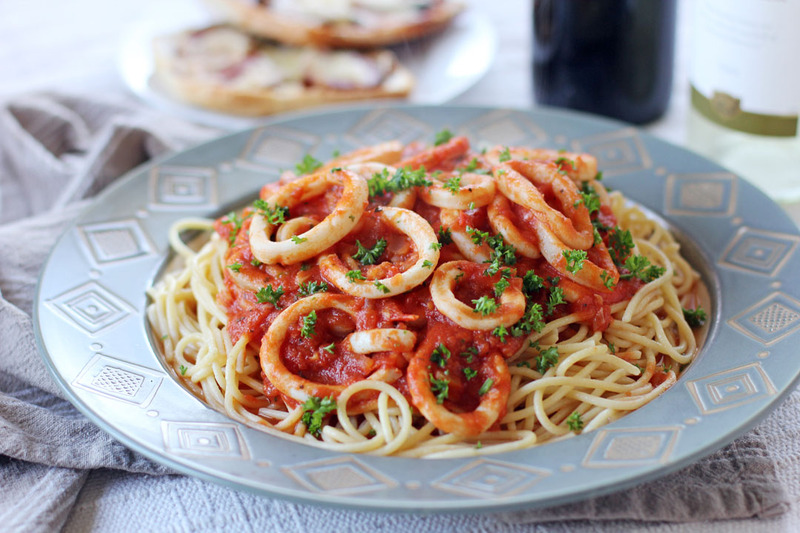 I love seafood pasta, and this is a recipe I am definitely willing to try. Calamari is hands-down one of the most loved seafood dishes in this house. This looks delicious and the kids would devour it! Ooh, love calamari on pasta! I cannot keep up with you! As usual, a gorgeous layout and a recipe that I must try! Oh YUM! I do love this dish, but whenever I’ve had it, the calamari was fried, so I love your version! This looks wonderful. We make stuffed calamari in marinara each Christmas Eve. 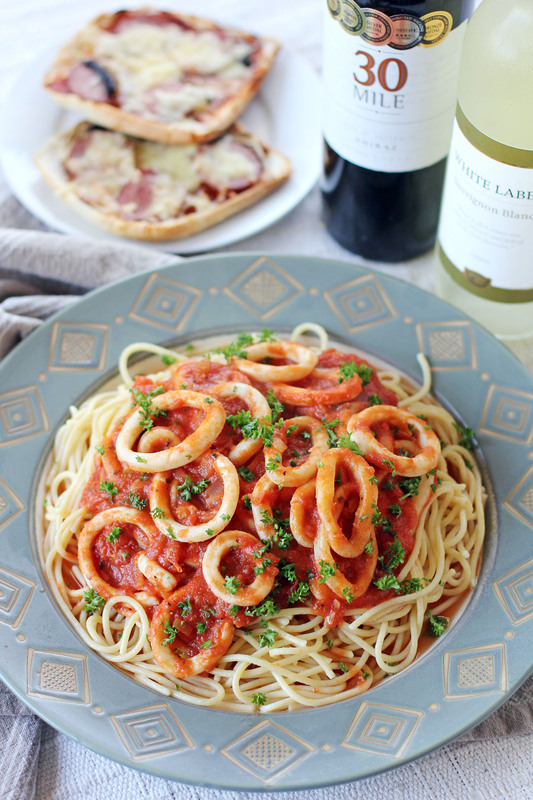 What a great way to use calamari! This looks so terrific — thanks so much. Simple and delicious Ray !